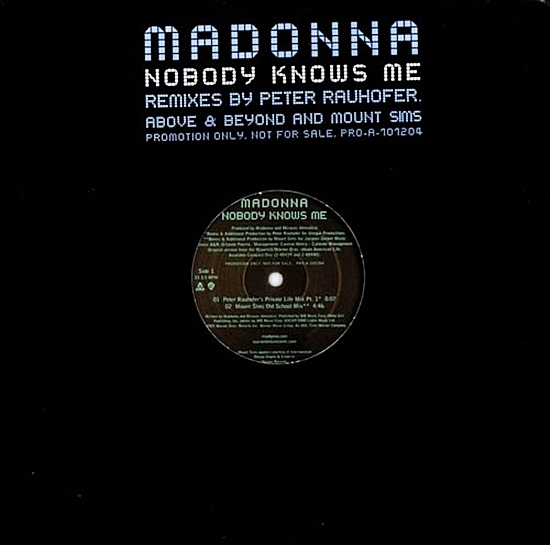 On December 13 2003, “Nobody Knows Me (P. Rauhofer, Above & Beyond, Mount Sims Mixes)” hit #4 on Billboard’s Hot Dance Music/Club Play chart in the US. The track from American Life had been serviced to clubs as a promo-only 12-inch, with the remixes being issued commercially in North America as part of the Nothing Fails maxi-single. On March 27 2001, the remixers for Madonna’s third single from the Music album, What It Feels Like For A Girl, were announced: Richard Humpty Vission, Paul Oakenfold, Above & Beyond, Victor Calderone and Tracy Young. Additional remixers were later added. Do you have a favourite remix for What It Feels Like For A Girl? 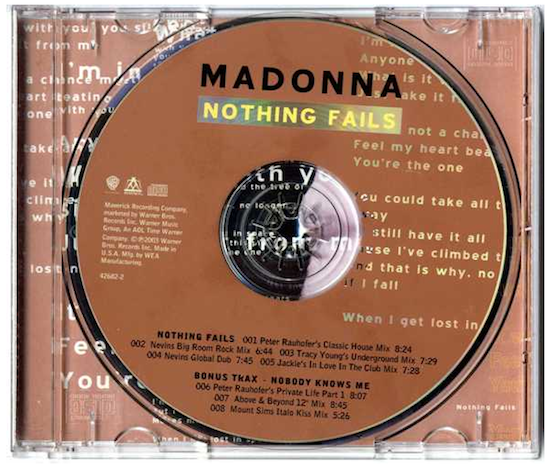 On December 9 2003, Madonna’s Nothing Fails CD maxi-single (featuring remixes of Nobody Knows Me) was released in the USA. Were CD single designers on strike when this was released? What happened to cool designs for singles? Lame lame lame ..